I recently talked about Proper Pruning – Are You Making These Common Pruning Mistakes?. Let’s continue that and talk about proper pruning for diseased branches. Even when covered in disease, leaves are often still photosynthesizing and we definitely don’t want to remove the photosynthesizing capacity of a plant while it’s being eaten by a fungus or other disease. It needs all of the nutrients it can get. Conventional gardening advice is that we can remove the source of the disease if we just use proper pruning to take out the diseased branches, but this is ludicrous when you think about it. Billions and billions of the disease-causing organism live all over our organic garden. But the most important shift in thinking we need to undertake is realizing the disease is not the problem. What you learn as you study organic gardening is the problem is that our plant is unhealthy. If it were healthier, it would easily cope with a tiny amount of disease. If it were optimally healthy, it wouldn’t have any disease. Period. Proper Pruning To Increase Airflow and Light Penetration? Plants have inhabited the earth for a few hundred million years. Human beings have been here for only perhaps a few hundred thousand years. They’ve been here perhaps 1000 times longer than we have and in that time, they learned how to grow. Each species learned how big it should grow and exactly how it should arrange its branches. 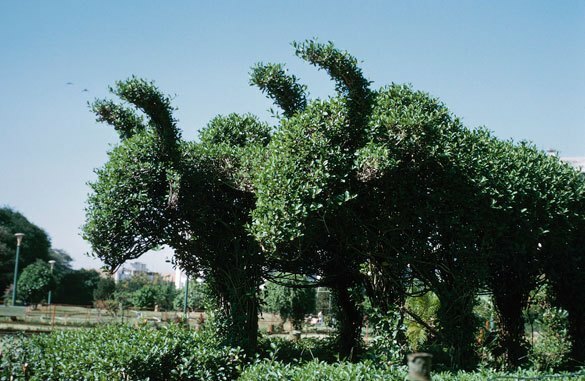 The idea that we can improve upon that with proper pruning is kind of funny when you think about it, right? We are taught to remove branches, especially in trees, to increase air circulation and light penetration, but the plant knows how much air and light it needs. All we’re doing is creating more wounds exposed to both the elements and predators, and decreased photosynthesizing capability. What about that branch that seems to go the wrong directly through the tree? The tree must have messed up right? I doubt it. The tree grew the branch that way on purpose, no doubt, in order to find the perfect balance. Much of the pruning that is done in residential gardens is for our aesthetic pleasure. It is decidedly not proper pruning. We prune shrubs to keep them nice and small to fit the place we planted them, when simply putting the right plant there in the first place would have been better. We prune trees so they don’t hit the hydro wires, when again – putting the right plant there in the first place would have been better. And when it comes to diseased leaves and branches, we need to think twice before pruning them out. The plant may still need the photosynthesizing capability and nutrients from those leaves. You won’t remove the disease – you’ll just give it better access. Organic gardening is about improving the health of the plant to the point where disease has no affect on the plant at all. This is definitely one of those organic gardening tips that is different than the conventional method. What do you think? Do you agree or disagree? Post below. Haha. Love the picture! This is a very insightful article. It makes so much sense now that I think about it. I think it’s good for people to be aware of their objectives when pruning. Pruning for aesthetics is a perfectly legitimate undertaking, and in certain cases, pruning can be helpful to mitigate certain disease symptoms, many of which present aesthetic issues though not necessarily harmful to their hosts. It really is about knowing what the disease is first- fungus, bacteria, virus?- so you can respond in a way that does not end up helping the disease! Plants grow in response to genetics and the environment, and have evolved their own strategies to cope with disease and other issues, which is not quite the same as knowing/choosing how to grow. Also, we have long been involved in their breeding and domestication and changed evolutionary outcomes. I do believe woody plants could use some guidance from time to time- branches that rub continually can lead to open wounds just as susceptible to invasion as pruning cuts, and perhaps more so as proper cuts leave the quick growing callous forming collar in tact to re grow over the exposed wood. Unfortunately trees do NOT “know” that a young branch (or root!) that it starts today will grow to become the bough that girdles a main stem or other maladaption that precipitates decline and shortens lifespan. I agree everyone should be thinking twice about pruning and really know what, who and why before we go mucking about- and then feel perfectly at ease to shape and prune as wanted. All very well said. Thanks for sharing.